Nostalgia is a word made up of a Greek word for “homecoming” and a Greek word for “pain”. Normally, nostalgia is used as a word to mean an aching for going back home, or the general past. Given the roots of the word, though, you could make a case that it also means the pain that comes from a homecoming, like when you watch what was your favorite show when you were five in advance of a big-budget movie reboot and see just how stupid and inane it was. 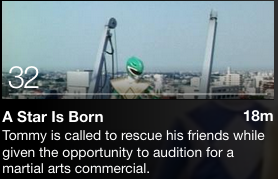 Yes, it is time to head onto Netflix as we start a look at the baseball episodes of the Power Rangers franchise, beginning with the 32nd episode of Mighty Morphin Power Rangers, “A Star is Born”. May the power protect us… after the jump.